Essentially we have three book scanner styles each with different characteristics. The first one I’d like to discuss is the Quidenus. It’s an A2 open book scanner using a 60-degree V cradle, the V cradle is very gentle on the spine of a book as the process does not require having to completely open the book. The Quidenus currently uses two 38 megapixel SLR cameras, with professional quality lenses. With the Quidenus we are achieving 400 dpi optical for each A3 page from an A2 Book because each camera takes a shot of left page / right page. This Scanner is essentially futureproof; it utilises LED Lighting, to upgrade the Resolution, we simply update the SLR Cameras to increase the Resolution. The Quidenus produces very high-quality images. 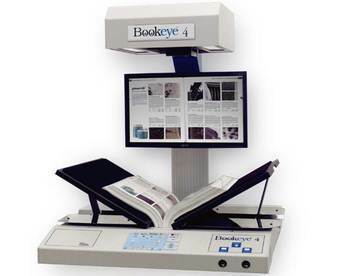 The second style of scanner used by Microsystems is the Bookeye 4 Pro. This scanner is a linear scanner. This A2 V Scanner achieves 600 dpi optical. The Linear Capture process is slower than using an SLR camera but facilitates the higher DPI Resolution. The Bookeye 4 also allows the configuration option as a V scanner or have it as a flat scanner. The third scanner type is an A1 sized scanner. Using a 50 megapixel SLR camera an A1 size open book achieves 360 dpi Optical resolution. As always the output is full 24-bit color with extremely high image quality. Again highly productive because we’re using an SLR camera to capture the images. With this scanner, we can scan above the platen or below. Usually, when you’re getting an A1 size open book, they’re not particularly thick because they’re already heavy and cumbersome. The book gutter generally has plenty of room and they are used to being completely flat. The need for a V scanner when you get to a book of that size is generally not such a significant issue. So, in essence, any of the archives, books, and ledgers we can capture at very high resolution levels. Because of the three scanners styles we have huge capacity. We’re generally working two shifts, five days a week, in our book section. We’ve chosen specifically not to use robotic book scanners. There are machines out there that will do the page turning for you. We have determined two things. A lot of Archivists don’t like that equipment because of the potential for damage. There’s also the potential, and it happens with a level of frequency that we can’t tolerate, where two pages are turned, so you actually lose a page. Microsystems need to capture every image correctly the first time, every time, everything for us is about productivity and reputation. So, our clients intrinsically receive the best of both worlds. We’re using the best equipment we can purchase and our staff are highly trained. We’re very experienced in what we’re doing and that comes down to the 40 years of history of Microsystems.